After two consecutive seasons of making the playoffs to include the World Series in 2015, the Mets have reloaded principally with their Fab Five pitchers reporting for duty healthy and a veteran presence balanced with young talent hungry for a championship. Master Alderson successfully brought back the thunder resigning electric #52 Yoenis Cespedes while also resigning steady Neil Walker, in essence, addition by retention. Terry Collins enters his seventh season at the helm of the Amazin’ Mets showcasing his ability to push all the right buttons while balancing the expectations of managing in New York and setting the tone for his ball club. 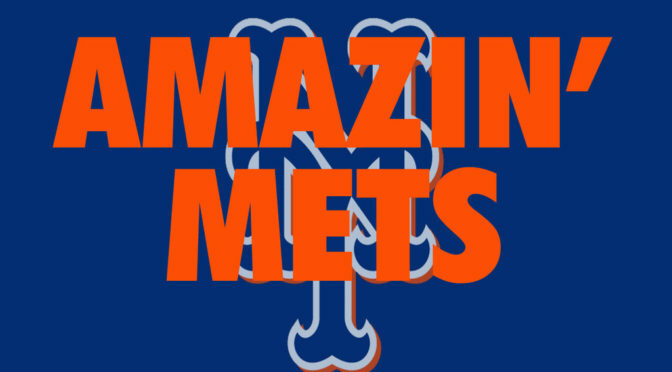 Looking to avoid the injury bug this year, will go a long way in getting the Amazin’ Mets back to championship baseball. Last year, 3 of 5 starting pitchers were lost by mid-July and 3 of 4 infielders were lost by August, not a formula for winning but somehow the Mets found a way to get into the playoffs through grit and determination. So here we are spring training 2017, and here come the Mets! Captain America’s (#5 David Wright) leadership, this Super Hero is battling his health doing everything he can to get on the field from serious back and neck injuries. Returning from the shadows, the Dark Knight (#33 Matt Harvey) has regained his form and he will continue to battle the enemy inside and outside of Gotham. As this glorious battle continues, the Dark Knight will return to form eliminating the criminal element throughout the league. His battery mate, Wolverine (#45 Zach Wheeler) continues to battle back from the demon Tommy John. Although the Wolverine was a mutant and engineered to not suffer human injuries, he was infected with a virus and suffered a similar injury to the Dark Knight. He inches closer to that 100 MPH heater as I write. The Silver Surfer (#48 Jacob deGrom) has had his ulnar nerve repaired after a three-month battle. Regularly underestimated entering Gotham’s rotation he emerged in 2014 as the NL Rookie of the League, and in 2015 he used his five different pitches to mow down the AL All-Stars in 10 pitches in a single inning, with three blazing strike outs, an All-Star game record. Enter stage right from the dugout, Thor (#34, Noah Syndergaard), “if you have a problem with me pitching inside, meet me 60 feet and 6 inches away” led the NY Mets with his big hammer, warrior spirit and willingness to challenge royalty at every turn. While the villain Moustakas fired F-bombs from his safe fortress in the dugout, and hid behind umpires, Thor picked up his hammer and went to work mowing the royalty down. The new villain he battles is #34 whom roams the outfield of the DC Swamp along with a nasty creature called Wolfman. Returning from a bone spur and a shoulder impingement injury, Iron Man (#32 Steven Matz), part of Gotham’s Vengeance Force, used his brilliant intellect and sophisticated pitches to silence the enemy at the plate, especially his deceptive slider and curve that freezes batters. After his off-season recovery, Iron Man is ready to soar to new heights. Sadly, The Hulk (#40, Bartolo Colon) has moved to archrival Atlanta where it has been reported they have better clubhouse meals and an unlimited buffet. The Mets must remain vigilant in battling The Hulk’s brute strength, craftiness and his appetite to defeat his enemies. It is now 2017, teams have reported for spring training, the Amazin’ Mets have reloaded and begin the fight to reclaim the Division Title of the NL East, National League Championship Pennant and ultimately winning the 2017 World Series. It is our time! Bring the season on, Play Ball! Guardian 6…………. Has Darryl Strawberry wandered back into the Mets Clubhouse with Dwight Gooden hiding massive quantities of doobage in their baseball gloves ??? Whatever the case, we can all agree on old Bartolo Colon who will be missed in the Mets Clubhouse if for no other reason than he always had a basket full of munchies to share with his team mates ! Bagwell in the Hall, Astros in the Series!